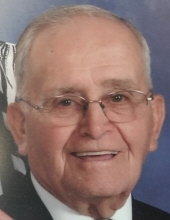 William G. Carter, 88, of Hopkinsville died at 12:37 a.m. Sunday, April 14, 2019 at his residence. Funeral services will be 10:00 a.m. Tuesday, April 16, 2019 at Hughart, Beard & Giles Funeral Home with the Rev. David Harrison and Mike Stokes officiating. Burial will follow in Macedonia Cemetery. Visitation will be Monday from 4:00 – 7:00 p.m. at the funeral home. Hughart, Beard & Giles Funeral Home is in charge of the arrangements. A native of Christian County, KY he was born June 29, 1930 the son of the late Howard and Stella Carter. He was a truck driver for Mobile Home City. He was a member of Concord Baptist Church for over 54 years where he had served as a Deacon, Sunday School Teacher, Trustee, and a Bus Driver. Survivors include his wife: Jo Nell Carter; his daughters: Jean Carter, Judy (Jimmy) Putty, and Billie Jo (Mike) Mathis all of Hopkinsville; his brother: Lewis (Martha) Carter of Hopkinsville; his sister: Kitty Carter of Hopkinsville; 8 grandchildren; 20 great grandchildren; and 7 great great grandchildren. "Email Address" would like to share the life celebration of William G. Carter. Click on the "link" to go to share a favorite memory or leave a condolence message for the family.